Pumice stones are usually used for removing dead skin from your feet during a pedicure. Surprisingly, they are also great for cleaning your bathroom or kitchen. Pumice stones are not just for pedicures. If you have stains or mineral deposits on your stove, bathtub or toilet bowl and they cannot be removed by any other means, such as with an acid-based cleaner or with vinegar, then try removing them with a pumice stone. The best type of pumice stone to use for cleaning is labeled "cleaning quality" and can be found in the cleaning supplies aisle of most stores. Cleaning quality pumice stones are very soft, and therefore less likely to scratch your fixture. You can also clean with cosmetic quality pumice stones, found in the beauty products aisle, but these stones are firmer and more likely to cause scratches. Before using the pumice stone, clean the stained area thoroughly by spraying it with undiluted vinegar and then rubbing it with a scrub brush. Do not use bleach on the stain. Then, wet the pumice stone and test it on the stained surface by rubbing gently in one small area and then checking for any scratches. Rub the stain lightly with the wet pumice stone. You will notice the stain lightening immediately and do not need to press hard, which could cause scratching. If you are worried about scratching, try alternating between rubbing with the pumice stone and rubbing with a toothbrush. 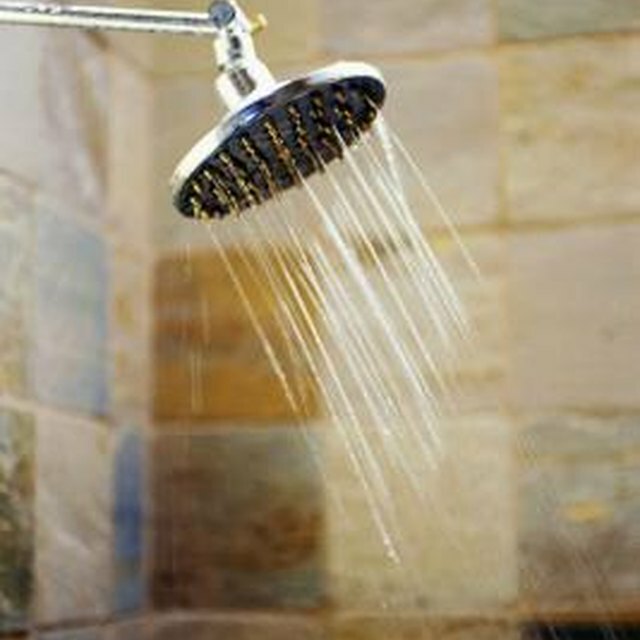 Make sure to keep the stone wet at all times, and run water over the stained area periodically to check your progress. Pumice stones can be used to clean white fixtures, preferably made of china. They will cause visible damage to colored fixtures, or enamel or plastic surfaces. Remove stains on your toilet, bathtub or stove-top as soon as they become visible. Over time, stains only become more difficult to remove. After you have removed a difficult stain, make sure to clean the area once a week with a cleaning liquid and brush so you will not need to resort to a pumice stone again. Karen Smith has been writing professionally since 2008. Her articles are published in the "Encyclopedia of Muslim-American History" and the upcoming "Dictionary of African Biography," as well as on Patheos.com and in volumes of "Anthropology News," "Contemporary Islam," "Islamic Africa" and "American Ethnologist." She has a Doctor of Philosophy in anthropology.